This comprehensive 2011 study revisits the influential 2009 Lowy Institute report Australia’s Diplomatic Deficit, and warns that Australia’s chronically underfunded and overstretched overseas diplomatic network risks Australia’s global security and standing. Despite some positive developments since 2009, when Diplomatic Deficit reported that Australia’s diplomatic network had been hollowed out by years of funding cuts under successive governments, Australia remains one of the lowest-performing OECD nations in terms of the extent of its diplomatic network abroad. Australia is 25th of 34 OECD nations, and smallest of all G20 nations, in total number of missions abroad – despite having the world’s 13th largest economy. DFAT’s overseas network is 37% smaller than it was two decades ago, despite massive growth in the Australian public service (60% in 15 years). Only 10% of DFAT staff have working-level proficiency in any Asian language. 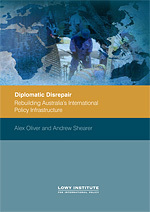 Diplomatic Disrepair: Rebuilding Australia’s International Policy Infrastructure revisits the Institute's 2009 Australia's Diplomatic Deficit, which reported that Australia’s diplomatic network had been hollowed out by years of funding cuts under successive governments. Two years later, Diplomatic Disrepair warns that Australia’s overseas diplomatic network remains chronically underfunded and overstretched, jeopardising Australia’s economic, political and security interests. Despite some positive developments since 2009, Australia in 2011 remains one of the lowest-performing OECD nations in terms of the extent of its diplomatic network abroad, and has the smallest overseas network of all G-20 nations. Effective diplomacy can pre-empt the need for far more expensive military and humanitarian interventions, and help support Australian jobs at a time of global economic instability. But Australia lacks the diplomatic missions and diplomats abroad to promote the nation’s interests, particularly in emerging centres of power in Asia, where rapid power shifts are creating growing uncertainty. The report argues that Australia’s diplomatic infrastructure is outdated and inadequate, and the ability to reach and influence important new international audiences is held back by poorly resourced and uncoordinated public diplomacy and a failure to embrace new media platforms.